Trusts are legal entities that can help you pass on assets to future generations with minimal tax consequences. Therefore, they are often used as a tool in tax planning. In the context of capital gains tax, putting assets into a trust can be a way of postponing at least any capital gains tax liability. If however a trust has annual income over £1000 then income tax will have to be paid at the top rate currently 45% and whilst there can be ways of reclaiming this where income is paid to someone who benefits from the Trust, all the taxes need to be considered in the round to assess what is going to be most appropriate. If you have assets that are inheritance tax free such as shares in a business those assets can be put into a trust for the inheritance tax benefit of future generations. By the same token if you die leaving assets which are tax free they can be left to the next generation equally tax free. It is a case of deciding what is going to be best for you and future generations. Trust assets are revalued every seven years and if the value is over the nil rate band tax free amount at that time, the excess is charged to inheritance tax at a maximum rate currently of 6%. You are now limited to having one trust in your lifetime and you can have a second trust in your Will on your death. Generally speaking assets are put into trust and after ten years the value put in no longer forms part of your estate. If you put in more than the tax free allowance, currently £325,000, inheritance tax has to be paid on the excess at 20%. Trusts are only one method of tax planning. It is possible of course to make straight-forward gifts, and there are annual exemptions that you can utilise before you need to consider whether you have to survive seven years. It is also possible to rearrange your investments, which can create tax saving opportunities. It may be sensible to rearrange ownership of assets between you and your spouse. There are no tax consequences between you of a rearrangement and you can achieve income tax and capital gains tax savings in appropriate cases. These benefits do apply to civil partners in all cases, exactly the same as with spouses, but they do not apply if you are not married. If you have assets over £325,000 then it is worth considering tax saving opportunities. Also you may have assets or people you wish to protect, which can be even more important. 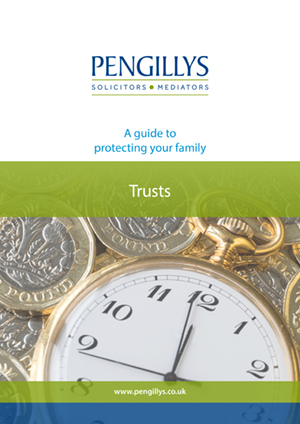 Trusts can come into their own for protection purposes whatever the value of your assets. The important thing is to get in touch and come and see us to discuss everything, so that you can reach a decision on what is best for you.